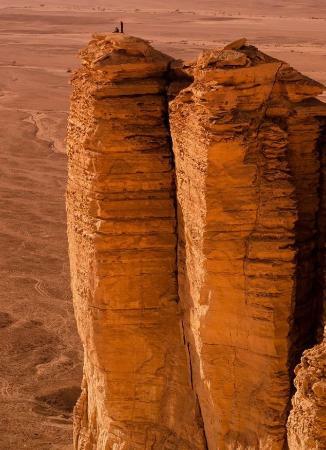 The Edge of the World (whose real name is Jebel Fihrayn) has become within a few years one of the most popular destinations around Riyadh, the capital of the Kingdom of Saudi Arabia. This “nickname” was given because of its main attraction that are the stunning viewpoints from the top of the 300-meter-high cliffs overlooking the surrounding plain. 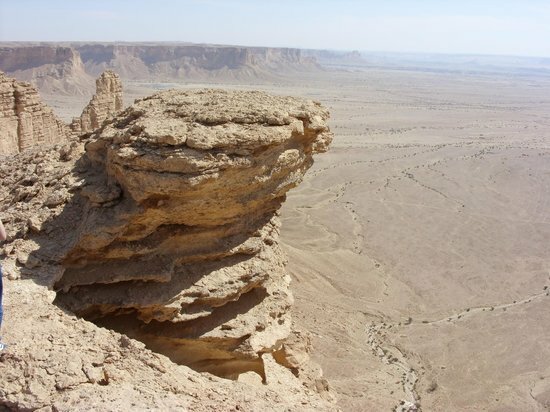 This escarpment is part of the much longer Jibal Tuwaiq which is one of the most prominent natural features of Saudi Arabia as it spreads over 1 000 kilometers from the province of Najran on the south up to Qassim in the north. It even played an important role in Arabia’s History as along its foot was one of the ancient caravan trade routes that used to cross the Arabian Peninsula from Yemen into the Levant and Persia.